Some of the brightest ideas have come to fruition when friends share stories and a few laughs over a beer. Whether Central PA natives or transplants, we’ve been brought together in the (717) with one common goal – to brew great beer among great company. 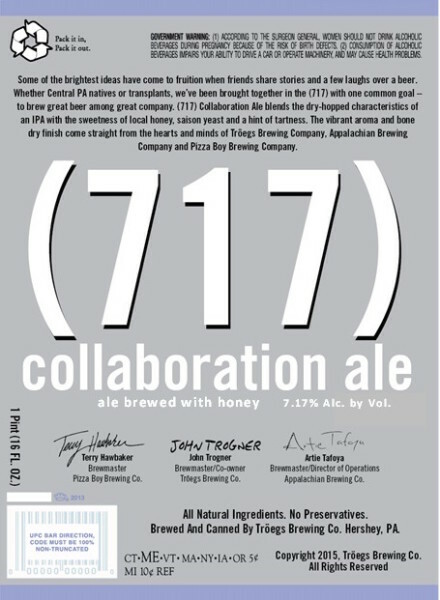 Brewed especially for the inaugural Harrisburg Beer Week, (717) Collaboration represents a joint endeavor between Tröegs, Appalachian Brewing Company and Pizza Boy Brewing Company. This spirited ale blends dry-hopped characteristics of an IPA with sweetness of local honey, saison yeast, and a hint of tartness to deliver a vibrant aroma and bone dry finish. We also utilized malted barley that was steeped, floor-malted and then kilned especially for this beer by Deer Creek Malthouse, a local producer of artisan malts from the Philadelphia area. Barrels & Bottles Brewery “Hoppy Peeps” Walk The Plank for Easter Introducing Abnormal Beer Co. – San Diego’s Newest Brewery!